Size Large: 11.5" - 13" Size X-Large: 13" - 15" Size Medium: 10" - 11.5" Size Small: 8" - 10"
Provides the therapeutic warming values to reduce tendon stress. 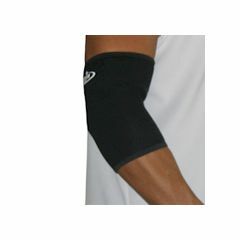 Provides comfortable compression to the forearm muscles and tendons. Anatomically contoured to ensure comfort and correct positioning. Designed to be worn on either the left or right elbow. CS-49024 - Size Large: 11.5" - 13"
CS-49025 - Size X-Large: 13" - 15"
CS-49023 - Size Medium: 10" - 11.5"
CS-49022 - Size Small: 8" - 10"
stitching is not good in . Have golfers elbow. Use this while at work. It relieved the pain associated with it. Awesome for any weight lifters! I've had tennis elbow and tendon issues in the past from heavy lifting. These sleeves not only give me the light compress I need when working out, but most important . . .the sleeves keep my joints warm and fluid during my workout . . .for heavy lifters at 35 years or more ( that is important ). Great product, just make sure you get the right size for your arms!! Using to reduce edema nd support at medial elbow in order to play volleyball with less pain. Poor quality product, over priced, to thin for any use. In less than one month it's all ready wore out. Comfortable. Easy To Use. Effective.